Extremists from all sides find fault in Benedict XVI’s visit, which goes to show that his words in favour of dialogue and tolerance have hit their mark. On the plane taking him back to Rome he says it is easier to see the difficulties facing peace, but nothing is more visible than the desire for peace. Rome (AsiaNews) – In Lebanon As Safir, a pro-Syrian newspaper close to the extremists of Hizbollah and Hamas, wrote that the moral authority of the Pope “has no influence on the Arab East that it can leave a trace to shape change.” A Hamas leader accused the Pontiff of not saying things which he had actually said, whilst an imam in Nazareth, who wanted to build a mosque close to the Church of the Nativity, said he “was not welcome.” Israeli closer to the opposition and the ultra-orthodox right attacked him, also forgetting what he said the same day. Part of the Western media echoed such views. If extremists and others, those who are against him on principle, attack him, then Benedict XVI has achieved some results for one does not attack someone who is irrelevant. The Pope’s trip, as the Holy Father noted, had several goals. It was pastoral for Catholics living in this land, ecumenical for other Christians, inter-faith for Jews and Muslims, and political for a renewed peace process in the Middle East. 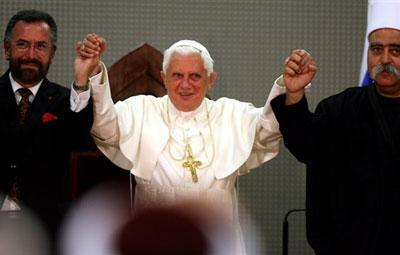 And whatever one might have thought, liked or disliked, Benedict XVI confronted each issue speaking his mind. To Israelis he spoke about the right of the Palestinians to their own state, about freedom of movement and religion. To Palestinians he spoke about the right of Israelis to live in security and about the need to oppose terrorism. But peace was at the top of his agenda. From he start peace was on his lips, from the moment he landed in Israel he called for “a just and lasting solution” that would enable “both peoples” to “live in peace in a homeland of their own”, a notion he specified when he travelled to Bethlehem in the Palestinian Territories, referring to a “sovereign Palestinian homeland” that is “secure and at peace with its neighbours, within internationally recognized borders,” pleading with the peoples of the regions at war for 60 years “to put aside whatever grievances and divisions” they may have. He reiterated the same point on his departure when he insisted that “Israel has the right to exist, and to enjoy peace and security within internationally agreed borders,” and that the “the Palestinian people have a right to a sovereign independent homeland, to live with dignity and to travel freely,” a point he stressed, creating a wave of sympathy for him across the Arab world, a point that is quintessentially political, an issue Benedict XVI raised when he met Palestinian President Mahmoud Abbas, who is hated by Hamas and company. On several occasions, Benedict XVI encouraged the region’s Catholics, suffering form economic difficulties and caught between Israelis and Muslims. In Nazareth they came in great numbers, 40,000, gathering for Mass in what was the largest assembly of Christians in the Holy Land in recent years. In Jordan he presided over the start of a Catholic university, an institution which will enhance Catholic cultural profile, and blessed the first stones of new churches. This, too, matters. A spirit of ecumenism found many expressions of affection and mutual support for dialogue. Today he told reporters that the ecumenical atmosphere was encouraging; it is the Holy Land that encourages. Inter-faith relations with Muslims saw great signs of respect and sympathy in Jordan. This manifested itself when a mat was laid down inside Amman’s al-Hussein bin-Talal Mosque to allow the Pope to enter without removing his shoes. King Abdullah’s religious adviser, Prince Ghazi, one of the 138 Muslim scholars who signed a letter in favour of dialogue, did the same. Again in Amman the Holy father told Christians that they must meet the “challenge to cultivate for the good, in the context of faith and truth, the vast potential of human reason” so as to show that religion is not “necessarily a cause of division in our world.” Indeed in a clear reference to fundamentalism, he said that “religion is disfigured when pressed into the service of ignorance or prejudice, contempt, violence and abuse”. The incident at the inter-faith meeting held at the Notre Dame of Jerusalem Center involving Sheik Taisir Tamini, who got into an anti-Israel diatribe, and the statement by the Grand Mufti of Jerusalem Mohammad Hussein, calling on the Pontiff to “play an active role to put an end to aggression” by “Israel against the Palestinians,” are both indicative of differences within Islam, but also of how important what the Pope says to the extent that others try to “use” him. During the visit the relationship with the Jews was an especially sensitive topic, the more so since its immediate backdrop was an atmosphere poisoned by the lifting earlier this of the excommunication on Lefevbrite and negationist Bishop Richard Williamson. Eventually that issue was cleared. For that the Pope was praised, including by the Association of Holocaust Survivors who expressed appreciation for his words, but he was also criticised for not mentioning that six million people died, for not apologising on behalf of the Catholic Church for its anti-Semitism, for not highlighting German responsibility and Nazism. In the final analysis, this is already a success.